When the founders of Giant Loop developed their first generation bags, the focus of testing was on hard dirt bike riding. The concept was a good one. Create luggage that works on smaller bikes, where there hasn’t been much in the way of luggage options in the past. But it soon became obvious, these systems would work just as well on smaller street bikes. The question now was - how would they work on vintage bikes? We got our hands on a set-up and proceeded to run it through its paces on a vintage 1972 Honda SL 350. Back in the days of the SL series, Honda never created any sort of storage options for the bikes. In fact, they didn’t even provide any possibilities affixed to the body work to allow for such add-ons later. Giant Loops Coyote and Great Basin bags lend themselves well to the dilemma providing a wraparound storage unit you affix at the passenger seat or behind it on the rear fender. 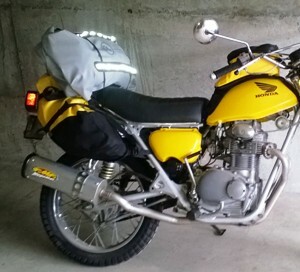 Our test system included the 30 liter Coyote bag which we proceeded to fill up with all the items that should go on a day ride like tire repair kit, tools, spares, various health and first aid sundries, rain gear, spare gloves, a liter of water and more. Oddly enough, that didn’t fill the bag completely. Two days of spare underwear and a shower kit was added since the plan was to spend three days and two nights camping on Orcas Island. The larger Great Basin wraparound bag will hold double the cargo capacity of its little brother, clocking in at 60 liters. Both versions have optional stuff sacks and dry pods you can add for sorting gear. These will protect the interior of the wraparounds from excessive wear. Straps are a bit lengthy so we added a half dozen Quik Slip Keepers (available in the Sound RIDER! store) to rein in the excess. Giant Loop’s latest products are two single-welded seam dry bags. The 17 liter Rogue was a tad too small to hold the camping gear, but the larger Tillamook Dry Bag at 34 liters did very nicely holding the tent, sleeping bag, air mat, camp shoes and a Surface tablet PC. Using a few additional straps, the Tillamook was affixed atop the Coyote wraparound and the bike now had all the gear a rider would need to tour indefinitely. Both the Rogue and Tillamook feature roll tops on both sides of the bags, which means there is not a single seam with stitching anywhere on the bags, making them the ultimate in modern dry bag technology. We still needed to find a place to quick access items like a camera, eyewear cleaning items and our on-board USB cell phone charger. That was solved by adding the 4 liter Diablo Tank Bag over the gas tank. With a zippered nylon harness system, you can easily access the gas cap by unzipping the left and bottom edges of the tank bag and flipping it open. On the scale, the loaded Coyote wrap around clocked in at 33 pounds, while the Tillamook dry bag full with the overnight gear was 18 pounds. At a total of 51 pounds the added weight is hardly noticeable since a) it’s so light and b) the center of gravity is low. GL’s wraparound bags and tank bags are sold with a tube of seam sealer, which we highly advise you apply a few days before the first time you use them as the seams are not water tight on arrival from the manufacturer. GL's useful tips on sealing are included with your purchase. The SL 350 has been in our stable for more than 12 years and we’ve tried all kinds of luggage configurations that all failed until now. It’s great to finally be able to get the bike on the road for a multi-day trip and have a setup that works. Now – if we could just get those handle bars to stop vibrating so dang much!